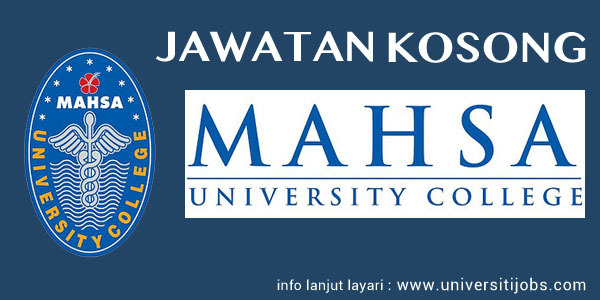 Jawatan kosong Mahsa University terkini bulan September 2016. Sukacita dimaklumkan, terdapat kekosongan Jawatan IT Support Staff, Business Development Executive, Professors / Assoc. Professors / Senior Lecturers / Lecturers (Pharmacy), Quality Manager di Mahsa University. Mahsa University would like to invite qualified candidate to fill in a vacancy as IT Support Staff, Business Development Executive, Professors / Assoc. Professors / Senior Lecturers / Lecturers (Pharmacy) and Quality Manager. Iklan rasmi jawatan kosong Mahsa University beserta maklumat lanjut syarat kelayakan dan cara permohonan sila layari laman sesawang Mahsa University disini.